Has anyone installed NT 5 on Thinkpad T500 ? Is there a w2k driver for "Intel Mobile 4 Series Integrated Graphics" ? Try asking there as well. There are no 2k drivers for T500 models. XP is the earliest that would work properly. Even if you got the 2k OS to install, it would perform very poorly. May I ask why you want to install such an old OS on a T500? It would be much more feasible to install it as a VM on W7 or linux. The last systems to have 2k support was the T43/R52 series. brchan wrote: There are no 2k drivers for T500 models. XP is the earliest that would work properly. Even if you got the 2k OS to install, it would perform very poorly. I even once got 98SE working on a T43, but obviously it's unsupported (98SE/ME was dropped after the T42/R51 generation) but I found working drivers elsewhere for chipset/video/etc. Lately I thought I would upgrade T500 to XP 64-bit. Installation went fine; display drivers, network drivers, fine. No sound driver would co-operate, no SD card would show. Does anyone know if there is 64-bit Ricoh and Conexant driver that works on T500 ? Welcome to the Windows XP Professional x64 boat, I suppose. Just remember to install Service Pack 2 if you have not, some drivers do not work without that Service Pack installed for some odd reason. You could try installing this audio driver that was meant for the W700, since it shares the same audio codec as your T500 does. There is also an x64 driver for the Ricoh R5C847, but you might want to manually install that instead, via the device manager by searching the .inf files. Thank you for your moral support. The Conexant driver you recommended works and we have sound. SD card is acting strange. The Ricoh drivers installed, and device manager lists Ricoh drivers and claims they work as intended; but the machine does not recognize SD card when I insert it. No problem, and it is good to hear that the audio driver works. Something is definitely not right then, from the looks of it. In any case, is that SD card of yours a normal SD or an SDHC or an SDXC card? If it is an SDXC card, you would need to install this hotfix to access it. 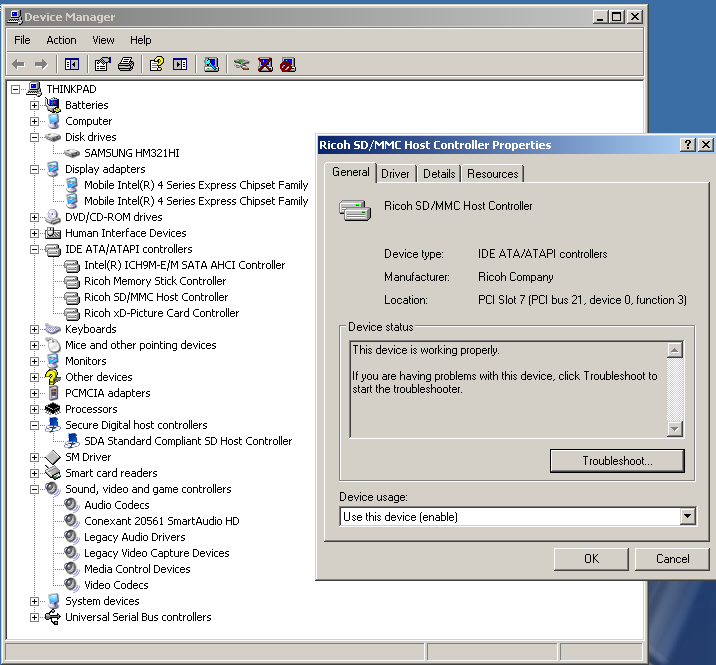 Also, are you able to see an entry for the SD card controller in the device manager? 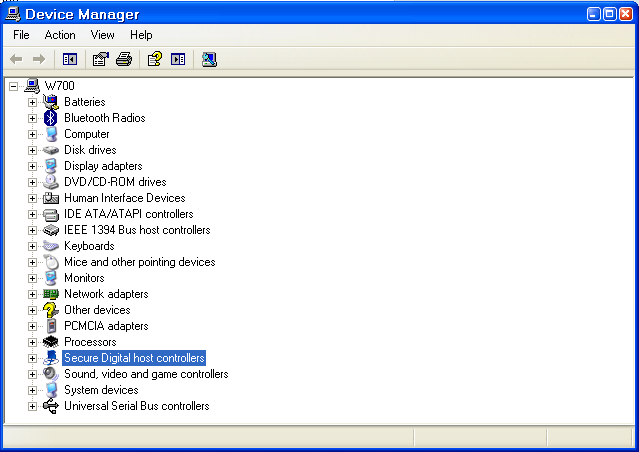 If your SD card controller is working fine, it should show up in the device manager's list. The SD card itself is detected under XP x86, but not under XP x64..? Did you try to force the SD card to be detected, by clicking the 'Scan for hardware changes' icon in the device manager? Try doing that if you did not, and be sure to leave the SD card inserted in your T500. This might probably cause it to recognize and see the SD card in the device manager. The SD card itself is detected under XP x86, but not under XP x64 ? Under XP 32-bit the SD card was my d:\ drive and had "progs" directory on it with my favourite programs. XP 32-bit detected the SD card even before Ricoh was installed. Linux detects it, too. If I insert the SD card as a USB stick, XP 64-bit detects it. "scan for hardware changes" does nothing. New Old Stock in the factory IBM packaging. $30.00 or best offer. CONUS.